As the story opens, Raph is yelling at Don to fix the hot water heater. Don reluctantly agrees to do so and heads to the basement. On his way, April cautions him to be on the lookout for her new tenet, a reclusive fellow named Kirby. As Don takes the stairs to the basement, he hears a strange sound, like wings flapping… when suddenly a winged monster comes flying right over his head! Don is shocked and investigates the cellar. He comes upon an open door and inside he finds Kirby, who’s busily drawing in his sketchbook. When the artist’s latest drawing leaps from the page and comes to life, Don lets out an exclamation. Kirby turns to see the Turtle, and remarks that he doesn’t remember drawing him and assumes that Don is an alien who has come to retrieve the “magic crystal.” Don calms Kirby down and asks how he made the drawing come to life. Kirby explains that he found the crystal in a pile of coal and accidently discovered its powers. The artist allows Donatello to try it out, and the Turtle draws a stick figure which leaps to life and promptly disappears. Kirby explains that all of the drawings made with the crystal-enhanced pencil come to life, only to disappear a few seconds later… all save for one, at least. Kirby then shows Don a strange mechanism that resembles some sort of high tech mirror – save for the fact that it doesn’t show any reflections. When Don reaches out to touch its face, he’s excited to find that his hand goes right into the machine! Donatello then sticks his head through the portal and disappears into it! Kirby is alarmed but a second later Don pokes his head back into the basement and invites Kirby to join him. The two enter the doorway and wind up on another world! The guys immediately notice that the monsters that Kirby has been drawing are everywhere on this planet… and they’re attacking the native human population! The creatures spot our heroes and close in on them. Donatello goes to work fighting the monsters as Kirby gets a bright idea – he draws Don with an anti-gravity gun strapped to his arm! 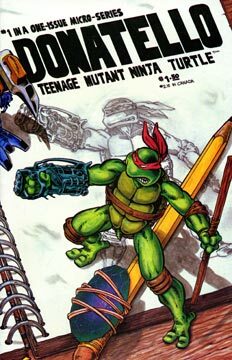 As soon as the artist finishes the sketch, the device appears on Donny’s arm and the Ninja Turtle puts it to good use. Unfortunately the gun fizzles out under the heavy usage and Kirby is forced to come up with Plan B – which is a gigantic robot that scoops up the beasts and deposits them inside the mouth of the machine. However, there are more monsters than the robot can handle, so Don has to go back to fighting the creatures in hand to hand combat. Kirby struggles to come up with Plan C as Don kicks monster cans. Finally Kirby realizes the perfect solution and starts drawing with a fury. In short order Kirby has taken all of his old sketches and added shackles of one sort or another to each beast – thus incapacitating every single one of them! The local warriors thank Kirby and call him a mighty sorceror, welcoming him to their homes and land. Don and Kirby decide that it’s time to head for home, when they find that the portal is closing rapidly! There’s barely time for one of them to escape, and Kirby pushes Don through the closing gap.